Yves Saint Laurent, rive gauche, black, sheer, organza, blouson, having a stand up pointed collar with a deep open neckline. The blouse ends at the waist having an attached self, wide belt, sheer, balloon sleeves with elastic at the wrists. 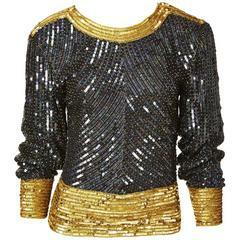 Yves Saint Laurent, iridescent, bugle beaded and sequined on silk top. Black body with gold cuffs, neckline and waistline. 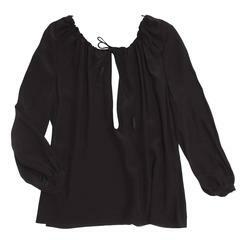 Sleeves are dolman shape. C. 1980's. Christian LaCroix, satin back crepe, wrap blouse, with covered buttons and "trumpet" sleeve detail. Gianfranco Ferre, magenta tone, knitted, ombred, bugle beaded, sleeveless shell with a deep slit detail at the back.